Fifty people died after a Boeing passenger plane crashed on landing in the city of Kazan in central Russia on Sunday, according to the Emergencies Ministry. A doctor working at the scene said that only ashes and rubble were left from the plane. The Boeing 737-500 passenger aircraft operated by Tatarstan Airlines exploded after crash-landing at Kazan Airport at 15:25 GMT. 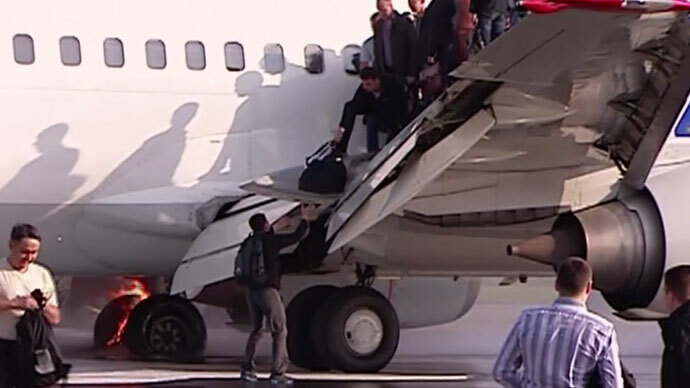 The jet’s nose reportedly hit the ground during touchdown. Flight U363 was traveling from Moscow's Domodedovo Airport. Initially, 44 fatalities were reported in the crash. The Federal Air Transport Agency later said that 50 people - including six crew members - were on board, all of whom were killed. 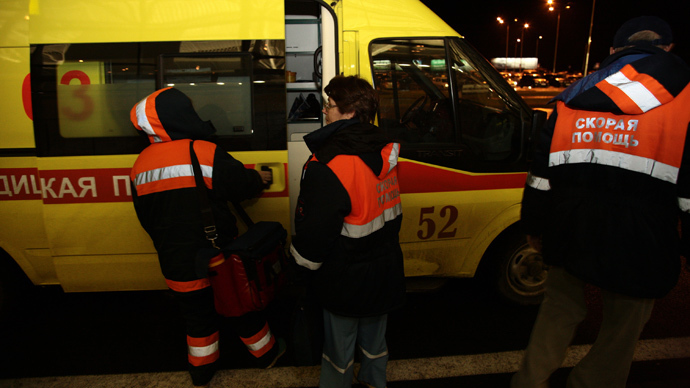 The Emergencies Ministry published a list of the victims, which included two children. Among the victims was British national Donna Bull, 53. She was an education consultant and the A-Level program director at Bellerbys College in Cambridge, UK. It was also confirmed that Irek Minnikhanov, son of Tatarstan President Rustam Minnikhanov, was among the passengers killed in the accident. The death toll includes the republic’s head of Federal Security Service, Aleksandr Antonov. Russian President Vladimir Putin spoke to Minnikhanov on the phone, expressing his condolences to relatives and friends of the deceased, and to the Tatarstan leader personally. Authorities and the airline’s insurance company will pay compensation of around US$93,700 to each of the victims' families. A day of mourning has been set for November 18. 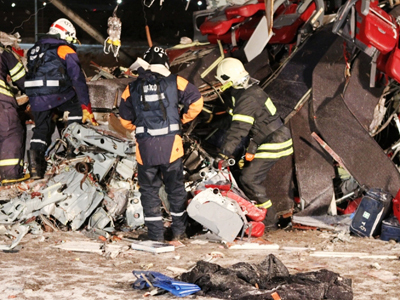 Rescuers have already recovered the bodies of all 50 people from the crash site, according to Tatarstan's Disaster Medicine Center. Now they are looking for flight data recorders. According to reports on social media, taxi drivers in Kazan are taking the victims' relatives to and from the airport free of charge. A total of 53 flights have been cancelled in Kazan's airport and redirected to other cities like Nizhniy Novgorod, Izhevsk, Nizhnekamsk and Cheboksary. The passenger jet caught on fire after the crash landing. The flames were extinguished less than one hour into the disaster. “Only ashes and pieces of foam were left from the plane [after the explosion],” a doctor from the emergency rescue team told ITAR-TASS. Kazan is the eighth most populous city in Russia. Located 800km east of Moscow, it is the capital of the largely Muslim Republic of Tatarstan. The same aircraft had made an earlier journey from Kazan to Moscow, and RT spoke to one of the passengers from that flight. Lenara Kashafutdinova described her experience, stating that the problem was not during the actual flight, but with its landing, which was very rocky and unstable. A witness traveling from Kazan to Moscow, who happened to be on the airfield at the moment of the crash, told RT that he heard a loud bang and felt some trembling. The shuttle bus he was on was then diverted back to the terminal. The young man did not report any panic and said that he and other passengers were allowed to pick up their luggage within about 15 minutes after the crash. The Investigation Committee has launched a probe into the crash. The head of the committee, Vladimir Markin, said the crash might have been caused by pilot error, technical malfunction, or weather conditions. In the meantime, the US National Transportation Safety Board has expressed its commitment to the investigation by offering to send a team of its experts, headed by Dennis Jones, a senior investigator. Experts from Russia's federal aviation authority, Rosaviation, will be joining the probe. According to local reports, there were high winds and cloudy skies over the airport in central Russia. Temperatures were above zero. An emergency services source told Interfax that the pilots apparently made some mistake when entering the second lap. “The plane attempted to land several times. One of the [fuel] tanks detonated while the plane was landing,” said Emergencies Ministry spokeswoman Irina Rossius. Despite this, according to the airline spokesman's words to Interfax, "the pilots, both born in 1966, had lots of experience." Another version involves problems with the landing gear. Apparently, one of the pilots radioed the control tower to report that there was "an issue with the landing configuration." Among other reasons considered by investigators is low-quality fuel, the Investigative Committee said. “We ordered to take samples of the fuel that was used to fill up the aircraft in Moscow,” a senior official told ITAR-TASS. The crew reported 500 meters before hitting the runway that the machinery was not ready for landing, an unnamed source told Interfax. According to another report, the plane is believed to have touched the ground with its wing when landing, said a representative of the Investigation Committee, as cited by RIA Novosti. An expert on air accidents, first-class pilot Vladimir Gerasimov told RT that he suspects “an apparent crew error,” as the plane failed to make a precise landing approach on its first try. However, this can be verified only after the flight data recorder of the crashed plane is analyzed, he added. The weather conditions were favorable for landing, argued sources from the Federal Service for Hydrometeorology and Environmental Monitoring of Russia. “The visibility was five thousand meters, the runway was dry. You cannot even imagine better conditions,” said an employee from the federal service, adding that it is unlikely that bad weather caused the crash. Probes are expected to start on Monday morning. The Boeing 737-500 is a make of a popular short- to medium-range twin-engine jet airliner, which was introduced in 1987. The series is also known as “Classic,” along with the 300 and the 400 models. The 737-500 can seat between 108 and 132 passengers, and has two cockpit crew members. The jet that crashed in Kazan - tail number VQ-BBN - was made in 1990. Tatarstan Airlines bought the plane in December 2008. This is not the first time that the aircraft has experienced problems. Just last year, the same plane was heading to Moscow when it made an emergency landing at the same terminal, a law enforcement source told Interfax. Twenty minutes after takeoff, alarm sensors were reportedly triggered due to depressurization of the cabin. None of the 78 people on board were injured. 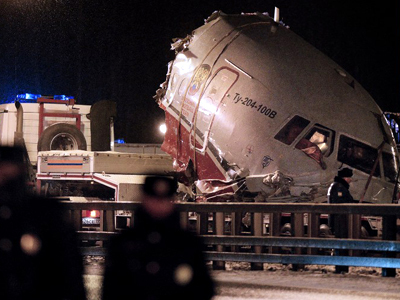 The crashed Boeing has been in service for 23 years, the airline's spokesperson told ITAR-TASS. She assured that the plane has been undergoing routine maintenance operations, adding that it had just recently been subject to maintenance. This is not the first accident involving a Boeing-737 in Russia. 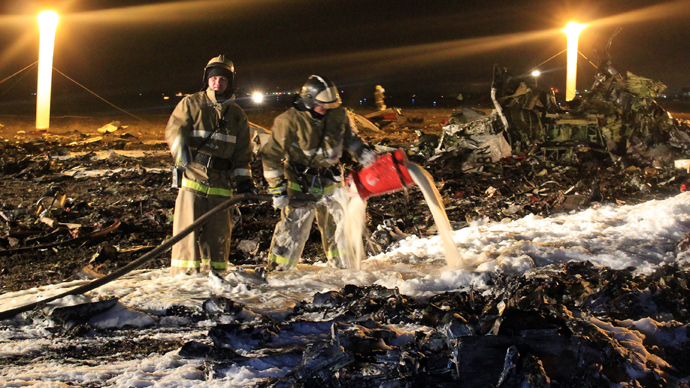 On May 18, a 400 jet model belonging to UTair caught fire just after landing at Moscow’s Vnukovo airport. Luckily, only one landing gear leg was set ablaze, and none of the 136 people on board were injured. 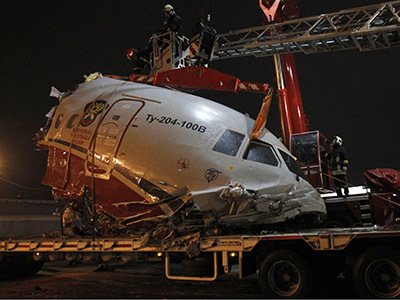 On December 30, 2012, a TU-204 jet belonging to Red Wings Airlines hard-landed at Moscow's Vnukovo Airport, breaking into several parts and crashing into a nearby highway. Five people were killed and four others seriously injured, including the driver of a car that was hit by the plane’s wheel. Only the crew was on board the plane.